With artists like Luka, for whom music is as fundamental as a heart beat, there can be no surprise that an album as fully realised as Head & Heart has come along so soon after 2012’s superb This New Morning. Luka explains that it has been an irresistible transition. The Phil Ware Trio – Phil on piano, Dave Redmond on double bass, Kevin Brady on drums – appealed to Luka immediately, not least considering the connection with Jarrett, and he contacted them. “This was new territory for me,” admits Luka. “I wanted to create a landscape for the songs which would enhance them but also somehow expose them in a very naked way. So came about the mad idea to just meet with the lads for the first time in the studio and instantly record with no rehearsal. Just feel the songs; play them, serve them, record them and release them.” Luka admits that recording live and unrehearsed with unfamiliar musicians was a “terrifying” but a “fantastic” experience, “utterly rewarding”. Head or heart? Head and heart! LEROY SUAVE(a.k.a. Brian ‘The Vicar’ Wakefield): vocals, guitar. “Leroy’s larynx should be preserved by the National Trust” – Daily Telegraph 1982. “Crooner who Walks, Boogie Beast that Cannot Die” – RAM Magazine 1986. 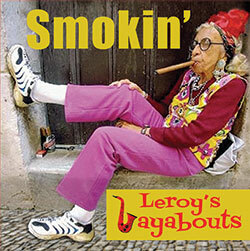 Best known as bandleader of Leroy’s Layabouts lets us in on some inside info…. What inspired you to become a singer/writer/band? and who are your early influences. ?